I have bird feeders around my house and the birds can really drain the thing quickly in the morning. 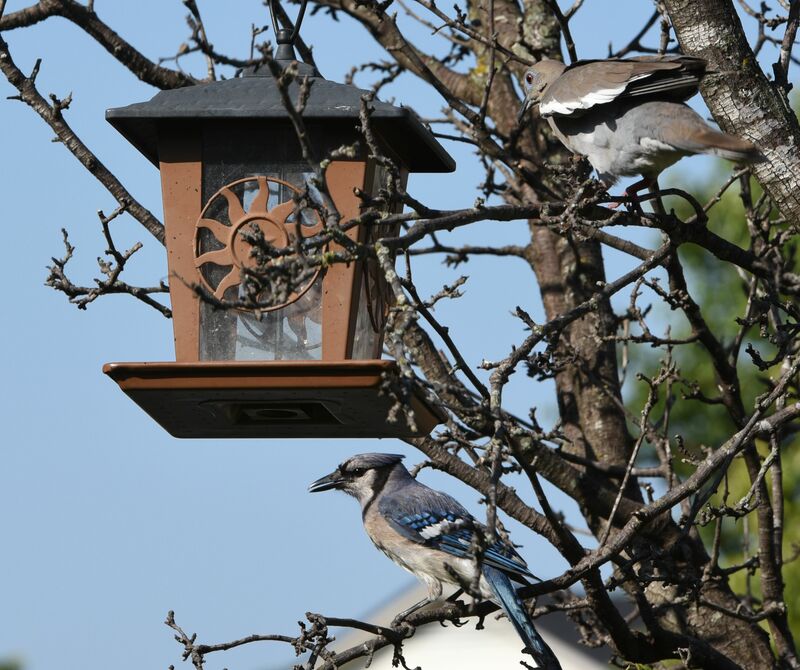 I thought it would be fun to attempt a time-lapse movie of the birds emptying the bird feeder. I waited until the sun rose over my roof and shone onto the bird feeder for good light and then put some seed in the feeder. I then set my camera up on my tripod, configured it for taking timed photos, and hid in the garage so the birds wouldn’t see me. I used a Sigma 70-200mm f/2.8 lens to get up close to the action. I took about an hour of photos as I figured that would be enough time for the birds to get all of the food. Below is the time-lapsed movie that I posted on Vimeo. It should play in the web page, but, here is the link if it doesn’t (https://vimeo.com/282193585). Birds draining my bird feeder in 1 hour from Jason Frels on Vimeo. When I put the movie together I was actually surprised at the number of birds that swarm the bird feeder when nobody is around. I could not see all of this from my hiding place while the camera was taking pictures. There is also quite a variety of birds that wait on me to fill the thing in the morning. I saw two kinds of doves, blue jays, sparrows, finches, and I usually see grackles out there. You can watch the level of the bird seed going down as well. then I started the shooting and hid in the garage and sipped coffee. The birds were waiting for me to go away and as soon as I did, they swarmed the feeder and went about breakfast. When it was done, I copied all of the files onto my computer to make the movie. I used to use Microsoft Movie Maker for this as it was free and pretty good, but they don’t seem to support it anymore so I looked for a different app to try. I settled on a program called Time-Lapse Tool. You can get a free version that will do DVD quality movies or pay for an upgrade for HD or 4k if you like. I figured DVD quality is good enough for this and I may upgrade if I ever get more serious about making time-lapse videos. It was easy to just open the software and point to the directory of photos and they were quickly integrated. I took a screen capture below. There is a slider to adjust the speed. I was going for about 24 frames per second to avoid a jumpy movie and found that if I right-clicked the slider, a window would open that allowed me to input the frame-rate I desired. I then built the movie, which took about a minute and then I had it. The movie file ended at about 25 seconds and takes up about 58MB. I think that a 6 second interval was probably a bit too high as the birds come in and out faster than that. If I do it again, I may try for a 3 second interval, which the camera should be able to do. I will also get the feeder out of the branches a little bit to clean up the view. If it was closer to sunrise or sunset, there would be a problem of flickering as the camera adjusts the exposure by thirds of a stop, but that wasn’t a problem at this time of day. There is special software available to adjust frame-to-frame exposure if necessary, and I may look into this some day. That was my little Sunday morning project. Hope you enjoyed and please leave a comment. Thanks for the comment. It’s fun to find stuff around the house like this to do. Great idea for a timelapse. Birds the world over can spot a sucker from a long way. Our locals also empty the feeder pretty quickly! I think that a shorter interval would be good, maybe also try and lengthen the exposure a bit to get a bit of blurring on each image? I’ve read that it makes the final movie less jerky but I haven’t tried it myself so I can’t be sure.